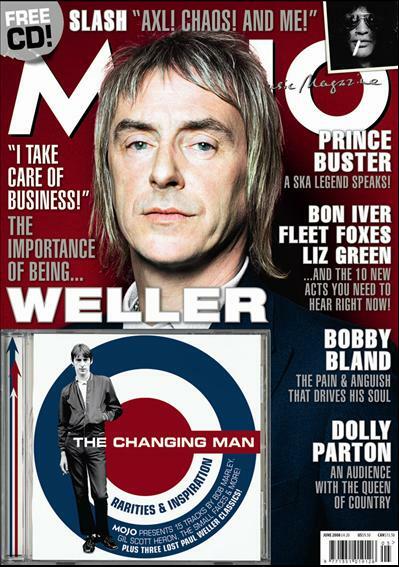 The Mojo Magazine – Paul Weller Special! Details… – Paul Weller News! PAUL WELLER: As The Modfather turns 50 and gears up to release his new double set 22 Dreams, MOJO’s Pat Gilbert joins the man who brought us The Jam, The Style Council, Wild Wood and Stanley Road for a booze-blitzed journey through the last thirty years. FREE CD! THE CHANGING MAN. Three lost Paul Weller classics sit alongside 15 gems from the likes of The Small Faces, William Bell, Gil Scott-Heron, The Staple Singers, Bob Marley and many, many more! Next Entry Paul Weller On BBC Radio 2 Today! !